I’m not one for mindlessly elevating naturally-derived ingredients and dismissing synthetic ones, but the biology student in me was intrigued by the idea of using saponins the way ancient people did. It is a vegan formula, and is free of alcohol, oil, and silicones. 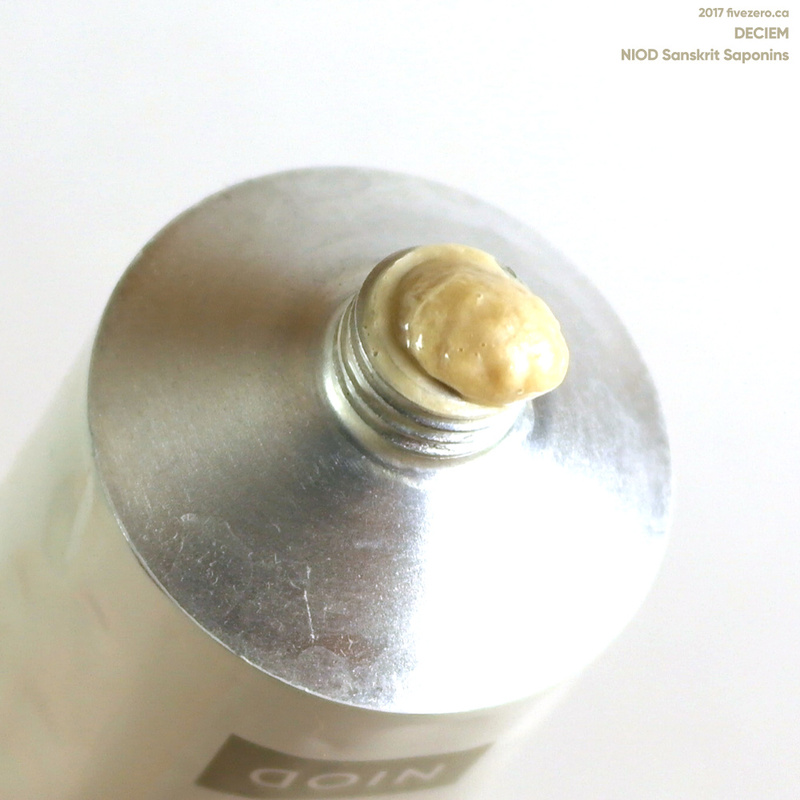 Sanskrit Saponins comes in a metal squeeze tube, which gives an earthy, natural, and solid tactile impression—clever, when you consider the alternative would have been a synthetic plastic tube. The drawback is, of course, that metal tubes are a pain in the backside to use once there is not as much product left. Still, better a metal tube than a tub of any material, for housing a cleanser. The product has a creamy consistency and is soft ochre in color. It’s not the most pleasant-looking product, but it does have an interesting, nutty kind of smell—quite light—that I like more than I would have thought. Sanskrit Saponins is not meant as a makeup remover, so I tend to use it in the mornings, or as a second cleanser after an oil-based cleanser. (Cleanser, cleanser! I hope DECIEM aren’t reading this.) It does seem to be fine removing a light application of makeup, though. It really works like any “normal” gel cleanser, except it has a creamy, slightly slick texture (read: it feels a little bit oily, even though it does not contain oil). It cleans my skin well and it does not leave it feeling in the least bit dry or taut, which is a godsend for someone like me, with forever dry skin. I find it to be a really pleasant face cleanser that is well-suited for me, and I will most likely keep a tube of it around at all times. Even at the regular price—though I’d recommend waiting for a sale—I think it’s a worthwhile product. I have yet to find a less expensive product that works as well as this does for my skin type. 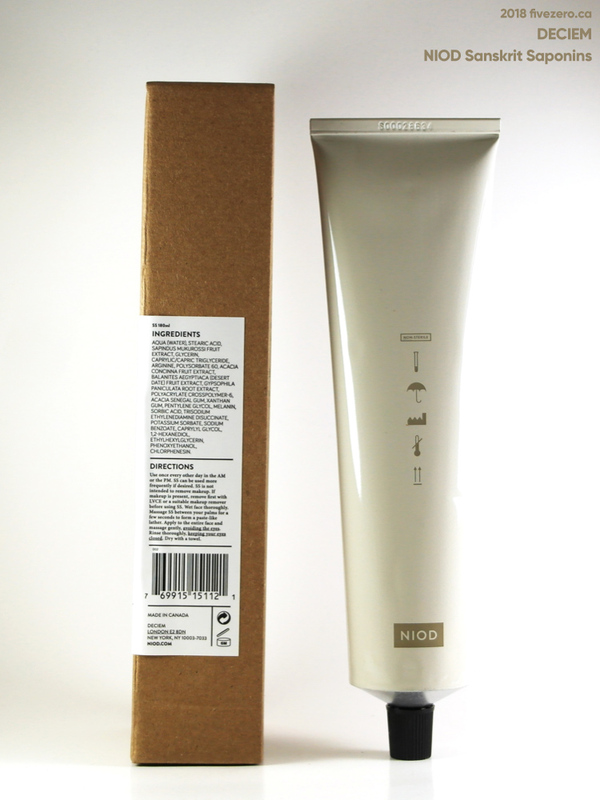 DECIEM NIOD Sanskrit Saponins comes in two sizes: 90 mL for US/CA$29, and 180 mL for US/CA$50. The formula is free of alcohol, oil, and silicones. The company is cruelty-free* and vegan. 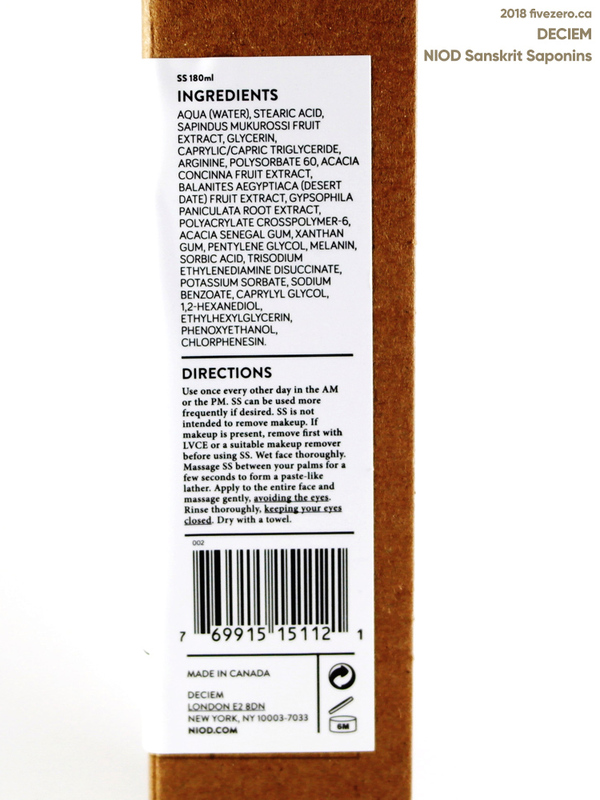 DECIEM was launched by Brandon Truaxe in 2013. “We decided to do 10 things at once and called our craziness DECIEM, coming from decima, the [L]atin word for 10 in a sequence.” The company is based in Toronto, ON, Canada, and currently has stores in Canada, Australia, Mexico, South Korea, and the UK. While DECIEM remains Canadian and cruelty-free itself, American cosmetic giant Estée Lauder, which is not cruelty-free, bought a stake in the company in June 2017. 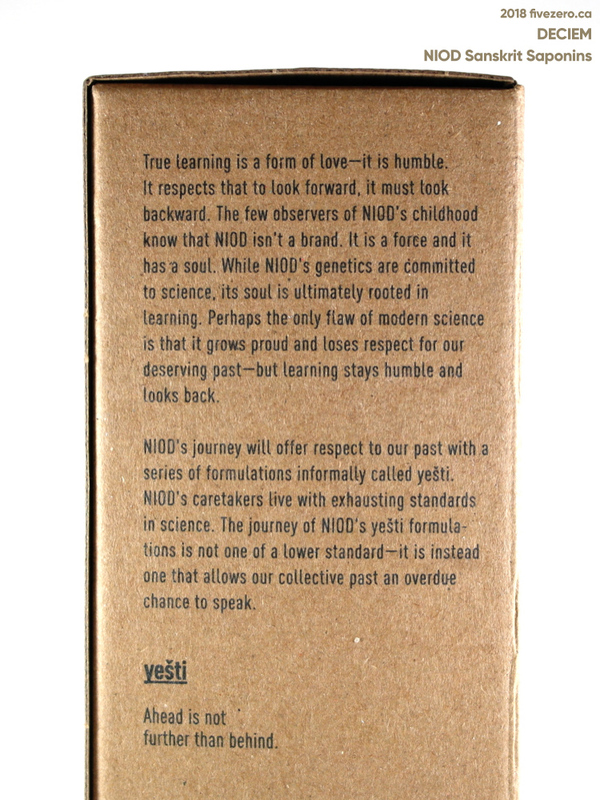 The NIOD brand hasn’t appealed to be simply because of allure of The Ordinary and Hylamide lines. Maybe one day I will “graduate” to NIOD. You scored such an awesome deal on the jumbo size – from reg price of $50 down to $9!? Wow.